50mm simulated surround-sound audio drivers and high-sensitivity noise-cancelling mic with flexible boom - get clear, unambiguous voice communication. Large diameter, circumaural earcup design blocks distracting sounds and keeps your head in the game. Soft-touch materials and elastomer headband lining for a firm, comfortable grip around the head. 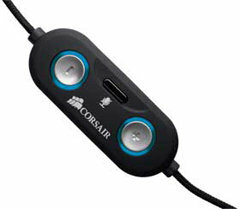 Corsair Vengeance 1500 provides amazing sound, superior comfort and features the power of Dolby Headphone multi-channel audio built-in. 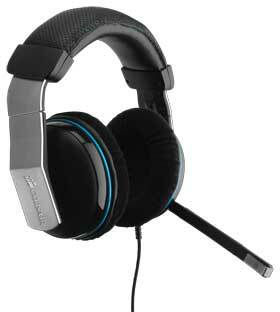 Experience immersive multi-channel gaming the way it was intended from the 7.1 / 5.1 Dolby Digital USB sound processing. Impressive 50mm audio drivers and high-sensitivity noise cancelling mic provide high bandwidth audio quality and clear in game chat. Large diameter, circumaural earcup design with micro fibre covers and memory-foam pads give you comfort even in extend hours wear.Corsair Vengeance 1500 7.1 / 5.1 Dolby Gaming Headset gives you a compelling gaming experience with accurate audio imaging you need if you’re playing to win. Designed for performance. The Vengeance 1500's large diameter, extra-deep memory foam earpads are designed for comfort. Vengeance 1500: Dolby® Headphone multi-channel audio built in. If you have onboard sound, the Vengeance 1500 provides easy one-cable USB connection and Dolby Headphone technology that lets you enjoy multi-channel games the way they were meant to be played. Dolby Headphone is compatible with any game with 3D audio, and helps reduce “headphone fatigue” while delivering the accurate 360-degree audio imaging you need if you’re playing to win. The Vengeance 1500's illuminated inline volume and microphone controller is easy to grab without taking your eyes off the action. The circumaural, closed-back design blocks distracting sounds and keeps your head in the game, and the extra-large inline volume and microphone control is easy to grab and use when the action heats up — you don't need to take your eyes off the screen.Whether you’re barking instructions to your teammates or chatting with old friends, you deserve to be heard. The unidirectional, noise-cancelling microphone is tuned to capture your voice loudly and clearly, while screening out distracting background noises. And, it flips out of sight when you’re not using it.